Today we were able to get in contact with Bill Dow. Bill is the father of one of our neighbours and I knew he was coming to Glasgow to see the pipe band competition. So after having breakfast off we went. Have I said that I will NEVER travel somewhere again without my portable GPS. It has made getting around painless. We were able to sit down with Bill and have get a good interview with him, and with a bit more video of the band, when it is all cut together I think it will make a nice little youtube video. After we were finished, Marianne was all set to come back to the hotel and start writing the story. Nope. I told her we were ½ way to Edinburgh so we were going to continue on and play tourist. (She really has got to learn to relax!) 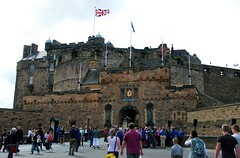 We punched in Edinburgh Castle into the GPS and off we went. The weather cooperated with us and we were able to have a nice couple of hours touring the castle grounds. It was surprisingly big and has some beautiful views of the city. Once we finished our tour we headed back to the car to start our way back to Glasgow. We decided to head back via Sterling so we could check it out and get our bearings for tomorrow. So we drove past the Sterling Castle, found John Forty’s Court. (The place we will be staying in Sterling) After locating these we were on the lookout for another place to grab some dinner. Another pub. 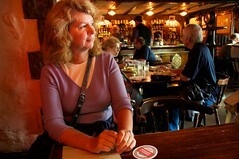 This time more traditional pub fair, fish and chips for me, and beef stew for Marianne. The food was great. After dinner we headed back to Glasgow and went straight to bed. Our sleep patterns are almost in sync with the local time now, but not quite. I think by tomorrow night we will be 100%. You can see all the photos I took today on my Flickr page.